Summer Feast Full of Freshness at Its "The Bistro"
Novotel Ambassador Gangnam's "The Bistro"
Have you tried diet? "Diet" has been a key word in the era of "Well-being." Women want to keep their bodies in shape and guys eat small to stay healthy. This kind of trend has led to an introduction of "low-calorie salad" menu, which is full of vitamin and inorganic fiber but low fat. This well-being menu is favored by women in their 20's and men of 30's to 40's for their quick lunch. European Restaurant at Novotel Ambassador Gangnam, "The Bistro," features "Salad Bar Combo Special" on August with energy-pumping combination of various dishes at Salad Bar and Grill Corner. Salad Bar is filled with "Greek Salad," "Bouquette of Salad Nisoise" and "Shrimp and Mango Cocktail" and more as "Roast Beef Rib Eye" and "Chop Steak and Steamed Rice" are instantly made for you at Grill Corner. The promotion is also available for lunch only at 10,000 won for Salad Bar and Today's Soup. If you wish to add your la carte, you can go with "Lunch Salad Bar Combo" menu at 25,000 won. 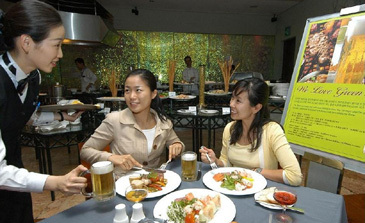 The summer feast offers even more for dinner, 42,000 won for desert bar and unlimited draft beer. Your night at The Bistro with the summer feast will be the right destination for your rest and romantic dinner. Reserve your seat today for your fresh summer day! Novotel Ambassador Gangnam, opened in September 1993, is a joint venture between Ambassadors Inc. and the French hospitality group Accor Asia Pacific. 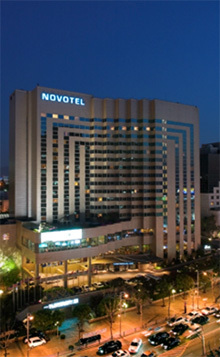 The Novotel Ambassador Gangnam has 334 deluxe rooms, including 9 suites and three executive floors. The hotel has six restaurants: an European casual dining restaurant, lobby lounge, Japanese super dining restaurant, pub-restaurant, buffet restaurant and deli. The four executive banquet halls and the 24-hour business center provide superior services to guests and a rental service of a wireless high speed internet LAN card which is accessible anywhere inside the hotel. The health club facilities include a swimming pool, golf driving range, gymnasium, sauna, aerobics studio, jogging track and bar which are open from 6:00 a.m. to 10:00 p.m. The location of the hotel offers easy access to the COEX World Trade Center, the Incheon International Airport as well as the Kyungbu Express Highway. Available modes of transportation include the KAL Limousine Bus, taxis as well as subway lines #2 and #7. The Business Floor (7th ~ 14th) has been specifically designed with the cost conscious business traveler in mind. Recently renovated to exude the chic and modern comfort, the Business Floor will become your home away from home. The guestrooms are also designed for functionality as they are equipped with high-speed LAN. The top three floors of the hotel (15th ~ 17th) have been designated as Executive Floors, providing additional convenience, privacy and privileges to guests, such as access to the Executive Lounge located on the 16th floor. The Executive Lounge has been completely renovated as a spacious and warm place with various exceptional services including breakfast, Happy Hour service and more. The feeling of a warm and gracious home, 9 suites arranged in different sizes and motifs, offer a spectacular view of the cityscape. It is a triumph of exceptional planning and design, a stunning decor graced by wall hangings, carvings and intricate pieces of art. Gracious ambience for the traveler with a taste for luxury along with the solace of friendly, prompt and attentive service, the ultimate concept in personalized and exclusive hotel living is born. The newly revamped Business Centre pays particular attention to the needs of visiting business executives. Modern facilities, friendly and professional service, the lobby level Business Centre provides an outlet for successful and competent, 24 hour business services. — The Novotel Business Centre is designed to be a complete office away from your office, 24 hours a day. Introducing hundreds of varieties of International dishes, the Buffet restaurant 'Festival' is set in a cozy dining atmosphere surrounded by glass windows that overlook the downtown Seoul. Enjoy a complete range of cold & hot Asian and Western dishes, Mongolian barbecue, a Sushi bar, dessert line and special promotional selections. Three private dining rooms are also available for private gatherings.